Seward head coach Toby Wynn he was disappointed in them. Not solely for a 74-61 loss at Cowley Saturday night, but also for a poor practice on Friday. Wynn says Friday’s practice carried over to Saturday’s loss at Scott Auditorium in Ark City. 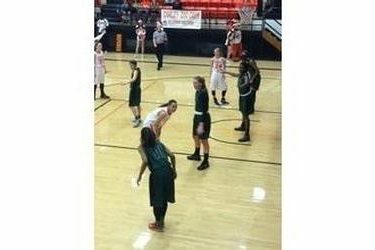 The Lady Saints led 13-6 before the Lady Tigers went on a 16-1 run. Crowley led 35-25 at the half. Seward clawed back in the second half as the were bullish on the boards out rebounding Cowley by 21. The game was tied at 58 before a 7-0 Cowley run. The #13 Lady Saints had 24 turnovers and shot 31 percent missing many high percentage shots. Daniela Galindo had 19 with nine rebounds. Joanna Grymek added 17 points and 13 rebounds. This marked Seward’s first game at Scott Audutorium in 11 years when Jim Littell was head coach and Wynn was his assistant. Seward is 8-2 and 1-1 in the KJCCC while Cowley is 12-2 and 3-0. Seward hosts Butler Wednesday at 6 with Saints Shootaround at 5:45 on 107.5 and kscbnews.net. Conestoga is the buyout sponsor.